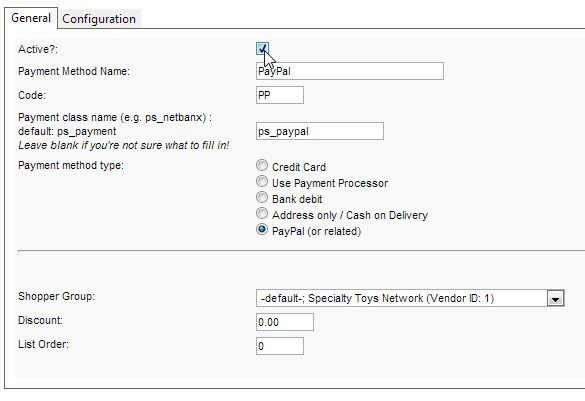 To use this payment processor, you will need a PayPal account set up and working. The PayPal payment processor communicates with your PayPal account during checkout. When your shopper selects PayPal as their payment option, they will be taken to the PayPal website to complete the payment. Step 1. If there is already a payment processor named PayPal, open it (click the name), and enter your account information. The "General" tab allows you to modify the active state, payment method name, the payment method code (displayed on the order), the shopper group association, discount and the processor's list order. The "Configuration" tab is for your PayPal account information. This is generally the email address associated with the PayPal account.